The Irwindale Events Center, (IEC) recently announced a special ticket offer for their loyal fans that can only be described as an unbelievable generous gift. The special offer covers eight NASCAR sanctioned nights of racing on the speedway's one half and one third mile ovals plus two nights of their famed Nights of Destruction. Fans can attend all of these events by purchasing season passes at an unbelievable cost of $50. With standard adult general admission ticket prices, on any one of these race nights, going for $15 the fans only has to do some simple math to realize that the season pass offer will save them $100. The season pass offer can currently be ordered online by dialing up www.irwindaleeventcenter.com. They can also be ordered by phone by dialing 1-626-358-1100 or visiting the office in person at 500 Speedway Drive. To coin a phrase from late night television infomercials: wait, there's more. The IEC is also offering it's fans preferred season parking passes for these events also value priced at $50 which is also a savings of $100. The parking passes are not available online, but they can be obtained via telephone or a visit to the track office. The fact that these events on the paved ovals were even scheduled at all can also be thought of as a special gift. It was believed back in January that track was going to be demolished by current property owners, Irwindale Outlet Partners LLC, in order to begin construction on a planned, and city approved, 700,00 square foot retail outlet mall. However, in late January the corporation informed track management that they could continue to promote races, on their current monthly lease agreement, until the end of July. That's when the IEC made quick work of developing a schedule for their paved ovals which, in turn, led to the availability of the budget friendly season packages for the fans. The highly anticipated 2016 season at Redwood Acres Raceway is quickly approaching. The excitement of racing returning to the 3/8-mile paved oval is high. So too is the intrigue of the new racing season with new cars and drivers in each division as well as a new division to the Acres. Acres fans are familiar with the local classes of roadrunners, mini stocks, bombers, Thunder Roadsters and late models. In addition to those five divisions, Redwood Acres Raceway will be featuring the Legends cars. 2016 will mark the first time ever that a Legend car has competed at the Acres and the division is likely to put on exciting events throughout the entire season. There are 11 scheduled races for the 2016 season. Redwood Acres Raceway will have its annual Play Day on Saturday April 23rd from noon to 5:00PM. The 2016 campaign will officially start the next weekend, Saturday April 30th. Some of the highlights of the 2016 schedule include the return of the North State Modified Series to the Acres twice, on Sunday May 29th and Saturday July 23rd. The late models will hold the Second Annual Firecracker 100 race on Saturday July 2nd which will be followed by a spectacular fireworks display. The top super late model drivers on the west coast will be racing at the Acres on Saturday August 6th when the Spears SRL Southwest Tour Series takes to the track. Saturday August 20th is Driver Appreciation Night and will feature the Second Annual Murrell 500. The year concludes on Saturday September 24th with Championship Night featuring the Roadrunner Big T Jackpot race and the popular boat race. Besides the racing on the asphalt, Redwood Acres Raceway will host racing on its dirt infield in 2016 featuring the Outlaw Karts. There are six scheduled non-point events for the karts including an event scheduled during the Redwood Acres Best of Humboldt Fair on Friday June 24th. The new class is certain to draw new racers and experienced veterans from Northern California. For more information regarding the 2016 schedule and/or rules packages, please visit Redwood Acres Raceway’s official website, www.racingtheacres.com. You can also find the Acres on Facebook at www.facebook.com/redwoodacresraceway/ and on Twitter @RacingTheAcres. Bakersfield, CA – For the second year, 51 FIFTY Energy Drink will present opening night of the $180,000 Winter Showdown at Kern County Raceway Park. The Saturday, February 27th “51 FIFTY Energy Drink Opening Night” will feature a full night of racing to start off the first day of competition at the Second Annual Winter Showdown, the richest short track race in the nation. 51 FIFTY Energy Drink Opening Night will feature single car qualifying for the Super Late Models starting at 5:00pm. Racing starts at 6pm with the first 40 lap segment of the Lucas Oil Modified Series’ 80 lap main event. The three Race for Autism Qualifying Races will be sandwiched in between the two 40 lap segments of the Lucas Oil Modified main event. More than 50 drivers will be split into three qualifying races, fighting for the top finishing positions to secure their spot in the 36 car field that will make up Sunday’s “Winter Showdown 250”. Drivers who do not transfer from their Race for Autism qualifying race will have a final shot at a Winter Showdown starting position by racing in Sunday’s Last Chance Race at 12:30pm. through its Race For Autism campaign.” stated the SRL’s Brian Olsen. Sunday’s “Winter Showdown 250” will be one of the richest asphalt short track events in the nation, with a record $30,000 payday going to the winner. Saturday, February 27th, it’s the 51 FIFTY Energy Drink Opening Night. Bring in an empty can of 51 FIFTY Energy Drink to Saturday’s opening night and get in for just $10! Qualifying at 5:00pm, racing begins at 6pm. 51 FIFTY Energy Drink is available at local Save Mart locations. Speedway Willow Springs recently released their 2016 schedule and it's apparent that the new racing season is going to, once again, generate a lot of action and family fun. 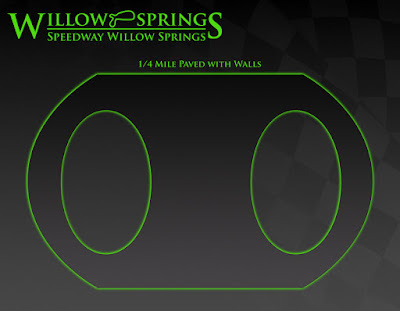 The quarter mile paved oval is located within the 600 plus acre racing complex, Willow Springs International Raceway, located in Rosamond-California. Speedway Promoter Andy D'Addario and the speedway staff has put together eight Saturdays, from March 26th until October 22nd, that is filled with multiple racing divisions along with special events, of a destruction-pure crazy nature, guaranteed to entertain their loyal fans. Pacing the action on the new schedule will be the Hooper's Rear Service Elite Division. 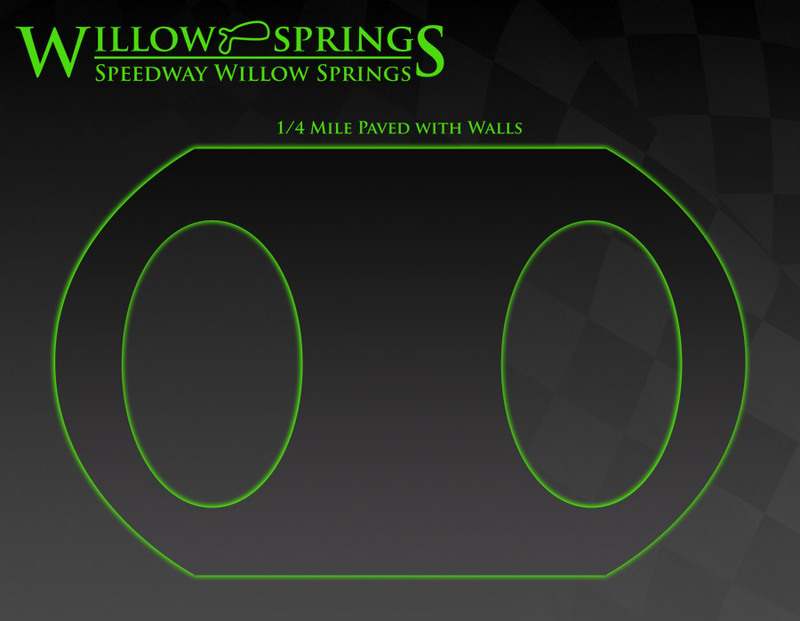 This action packed division is a special Speedway Willow Springs creation that allows late models, super late models, IMCA modifieds, Southwest Tour trucks and spec trucks to race together all under the auspices of a single rule book. Also seeing plenty of action this year will be the So Cal Enduro Racing Series which, in a period of one year, grew in popularity at a rate that not even speedway and series officials could have anticipated. This series features very affordable racing with building costs for the cars estimated to be around $1,000. Their main events will again range from 50 to 100 laps this year. It's perfect for team owners on a budget and it's also a great way for a new comer to launch a racing career. Also prominent on the Speedway Willow Springs schedule will be the Platinum Loan and Jewelry street stocks, Wayne and Dave's Automotive hobby stocks, mini stocks, skid plate racing and the legends X. The legends X concept is brand new to the speedway and reflects the strong imagination of the speedway staff. It begins with the very fast legends car that greatly resemble roadsters from the 1930's and '40 era. The drivers will drive around the speedway's quarter mile oval but that's where their traditional form of racing ends. That's because the legends X race course also includes a series of left and right road course turns, located in the speedway infield, along with a run through a very challenging gymkhana X. Again, this is the work of some very creative people at the speedway. That creative element also extends to special events such as the speedway's annual Destruction In The Desert. Promoter D'Addario and company love to destroy things in their infield area and, over the years, have created a series of very unique, challenging and even crazy events. This destructive tendency of extreme events includes: flag pole racing, redneck tire delivery, chain racing, backwards racing, the James Bond spin and the brand new concept they're calling rattle his cage which awards points to drivers for spinning out the car in front of them. In a recent speedway press release, D'A'ddario said there would be something destructive and crazy during each night adding: "we are going to attempt to destroy something every race night this season! We have the best minds (if that’s what you want to call it), working on crazy and insane ways to make an absolute mess of our infield. Some of the injury inducing ideas that have come my way so far are pretty outrageous! Every race WILL feature something new you haven’t seen before." The speedway team has also done an outstanding job of soliciting sponsorship for the 2016 season. Supporting the Speedway Willow Springs effort this year will be: Platinum Loan and Jewelry, High Desert Cellars, Misfit Motorsports, Pinnacle Peak Steak House, Lucas Oil Products, Hooper's Rear End Service, Wayne & Dave's Automotive, Studio Equipment Rentals, Adams Metalizing & Grinding, The Tire Store, Dezarov's Mobile Auto Service, Dominguez Mexican Restaurant, Scramblez, Street Customs, A To Z Signs, K&N Performance, Angels Touch Towing, Deist Safety, Abadak, KGG Electric, 10,000 RPM Clutches & Flywheels, Frank's Radios, Benz Sanitation, Linny White's Race Shop, Budweiser, Off Vintage Motorcycles and Rock Inn. March 26th – Opening Day- Ray Cran Memorial – Southwest Tour Truck Series, So-Cal Enduro, Elite Division (Late & Super Lates, Mods, SWTT & Spec Trucks), Street Stocks, Hobby Stocks, Mini Stocks, Skid Plates. 1PM Green Flag. April 16th – Day Race So-Cal Enduro, Elite Division, Street Stocks, Hobby Stocks, Mini Stocks, Skid Plates. 1PM Green Flag. May 14th – So-Cal Enduro, Elite Division, Street Stocks, Hobby Stocks, Mini Stocks, Skid Plates. June 4th – So-Cal Enduro, Elite Division, Street Stocks, Hobby Stocks, Mini Stocks, Skid Plates. August 13th – So-Cal Enduro, Elite Division, Street Stocks, Hobby Stocks, Mini Stocks, Skid Plates. September 17th – Southwest Tour Truck Series, Elite Division, Street Stocks, Hobby Stocks, Mini Stocks, Skid Plates. October 1st – Southwest Tour Truck Series, So-Cal Enduro, Elite Division, Street Stocks, Hobby Stocks, Mini Stocks, Skid Plates. October 22nd – 4th Annual Pumpkin Smash! So-Cal Enduro, Elite Division, Street Stocks, Hobby Stocks, Mini Stocks, Skid Plates.